Srinivasa Mangapuram is one such sacred temple in Tirupati having both Puranic and historical accounts into its credit. This temple dedicated Sri Kalyana Venkateswara Swami is rich in architectural elegance, ancient in its existence and sacred next to Tirupati Balaji Temple in Tirumala. Srinivasa Mangapuram is a small village 12 km to the west of Tirupati. 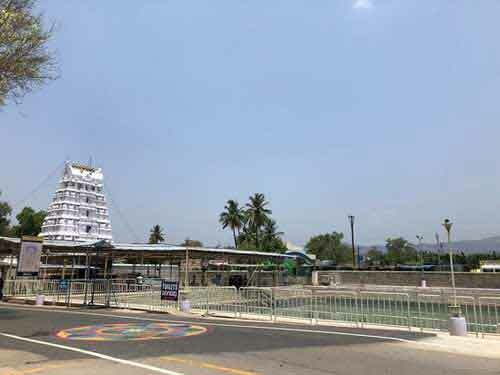 A short drive from Tirupati on the road leading to Madanapalli will take us to the temple of Kalyana Venkateswara Swami at Srinivasa Mangapuram. The majestic Rajagopuram and graceful Vimanam can be seen even before reaching the main temple. Legends say that Lord Venkateswara Swami after His marriage with Padmavathi Devi stayed here for sometime before proceeding to Tirumala. The shrine was renovated by Tallapaka Chinna Tiruvengatanatha in the 16th century. Bhavishyottara Purana narrates that after their celestial Kalyanam (marriage), both Goddess Padmavati and Lord Srinivasa lived at this place for some time. It was the advice of Sage Agastya that the newly wedded couple isn’t supposed to climb the sacred hill of Tirumala. Historically, this area has been identified with ‘Sithakutty’ village whose name is found in ancient inscriptions. Puranic legends identify this place as an extension of ‘Agastya Ashram’ i.e. hermitage of Sage Agastya that was built on the banks of River Vikalya (now called as Kalyani River). The most ancient footpath to Tirumala, ‘Srivari Mettu’ is very close to Srinivasa Mangapuram. All along the road that connects the temple with Srivari Mettu is sprinkled with medieval monuments, mostly built during Vijayanagara days. Unfortunately much of its antiquity in terms of historicity is not own due to loss of evidences such as inscriptions. The earliest inscription belongs to the Sangama dynastic rule of Vijayanagara Empire. From these evidences one can estimate the grandeur of this temple. Subsequently, Tallapaka Chinna Tirumalacharya took care of the temple. But a devastating flood to Kalyani River, in the later period, has caused the much destruction of the temple. During the chaotic period of 18th century, this temple was attacked and looted by Hyder Ali of Mysore. Sometime in the year 1940, a Brahmin by name Archakam Raghavendra Acharya Sundararaja Swamy came all the way from Kanchi to this place. He told the local people that a divine dream has guided him to here and he is ordered to perform puja to the Lord. The residents of Srinivasa Mangapuram village came forward to help the Brahman and their efforts resulted into the first ever renovation in last four hundred years. Thus, the temple came back to life after years of neglect. In 1967, this temple found its lost glory when Tirumala Tirupati Devasthanams took up the maintenance. Now, Sri Kalyana Venkateswara Swamy temple holds daily, weekly and annual festivals and rituals on grand scale while scores of devotees throng the temple every day. The temple reflects the typical Vijayanagara style of construction. The main entrance, called Mahadwaram is standing on a stone ‘Adhishtanam’ measuring 10’ in height. On either side of the entrance the stone images of Tallapaka Annamacharya and his son Pedda Tirumala Acharya have been nicely carved. Inside the temple premises Balipeetam and Dwajasthambam welcome the devotees. The main temple is standing majestically on a 10’ height Adhishtanam, facing the east. The Mukha Mandapa is decorated with 36 pillars with intricate carvings. The Sanctum Sanctorum is a square structure in which stands the gracious, 10’ height pratima of Sri Kalyana Venkateswara Swamy. The very sight of this pratima creates a divine feeling called ‘Bhaya Bhakti’ i.e. devotion coupled with fear (of divinity.) The graceful smile on the lips of Sri Swamy will take away the sadness & tiresomeness from the devotees. The grand murti with four arms emanates the resplendent charm of Sri Maha Vishnu at Vaikuntam. As for the rituals performed, they are of 4 types i.e. daily, weekly, monthly and annual. Annual Vasanthotsavam is performed during Vaishakha month. Amongst all the annual utsavams, annual Brahmotsavams is the most important one. The 9 day-long celebrations are held during Magha Masa which usually corresponds with January/February months of English calendar. During these utsavams, Kalyana Venkateswara Swami along with His two divine Consorts ascends 16 vehicles. These Vahana sevas will be held in morning and night. On the Garuda Seva day swami will be adorned with some special ornaments and garlands that comes from Tirumala in a procession. On 9th day grand Rathotsavam (chariot) will be performed. The Brahmotsavams conclude on 10th day with Chakrasnanam. Thousands of pilgrims take part in these Brahmotsavams to obtain the blessings of Sri Kalyana Venkateswara Swami and His Consorts.